My four year old loves all things spidery, lizardy, snakey, or reptilian. I had night terrors involving arachnids as a child, so that makes me a less-than-ideal boy mom, but whatever. He acquired a baby lizard recently, and while talking him out of keeping it (What will we feed it, honey? Inside, I am thinking, Salmonella!! ), we purchased a $2 toy lizard to ease the pain. But when we went swimming on Labor Day as a family, the toy lizard got lost in the shuffle. Ben was heartbroken about it as we climbed into our minivan to leave the pool. Finally, I told him to pray with his big sister (six) while Daddy and I got out to take one more look. As we headed back to the pool area, I prayed God, you know how this matters to him. Please help us find this silly thing, for Benjamin. We circled the pool, and checked one final spot–the filter. There was the lizard. Ben’s joy over being reunited with the lizard was multiplied by his answered prayer. Silly, right? I mean, it could have easily gone the other way, and I could have told you God was using the lizard to teach Ben responsibility. But I’ve been reading Paul Miller’s book A Praying Life, and it has challenged some of my cynicism that builds up towards prayer. In Miller’s book, he does not resort to guilt-trips. 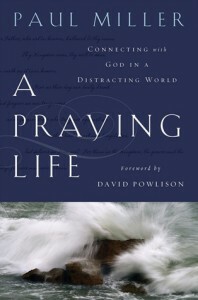 Paul Tripp, in reviewing the book says, “This is a book on prayer that actually makes you want to pray!” How novel! I completely agree with him. This book began bearing prayer fruit in my life right away. Everyone talks now about how prayer is relationship, but often what people mean is having warm fuzzies with God. Nothing wrong with warm fuzzies, but relationships are far richer and more complex. We can’t pray effectively until we get in touch with our inner brat. When we see our own self-will, it opens the door to doing things through God. Instead of singing Frank Sinatra’s song “My Way,” we enter into God’s story and watch him do it his way. No one works like Him. You don’t need self-discipline to pray continuously; you just need to be poor in spirit.